The building blocks for the Dr. Martin Luther King Jr. Memorial will soon begin the journey from China to the Tidal Basin on the National Mall. The Washington Post reports that if all goes well, in a few weeks 159 granite blocks will be loaded onto ships in Xiamen, China, to make the 11,000-mile journey. The use of granite made-in-China for this very American memorial has been controversial. In the end it was decided that this type of granite is structurally more desirable than granite available here in the USA. One of the blocks is sculpted in the likeness of Dr. Martin Luther King Jr. The other blocks make up the massive three-part sculpture, comprising the centerpiece of the memorial. 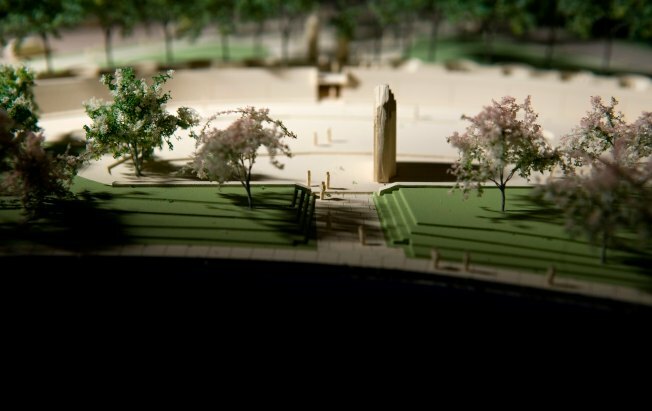 Located on four acres of land set aside for the memorial, it will be awesome. The part called the Stone of Hope is more than 30 feet tall with the image of King in a business suit. The weight of King's head alone will be 46 tons. It will be bigger than the statues of Jefferson and Lincoln at their respective memorials. A crane will lift the blocks into place at the Tidal Basin. They will fit together in a circular pattern and built upward, with concrete filling in. Kirk Savage, professor of the history of art and architecture at the University of Pittsburgh told the Washington Post, "This is a really massive piece of sculpture." He added that the tradition of colossal scupture goes back to ancient times. We know it in the United States from the Statue of Liberty and Mount Rushmore...but in Washington, this will be a very, very unusual piece of work...It's almost like a pyramid they're building. It hasn't been an easy road getting this far along on the King memorial. Authorized by Congress in 1996, the project has been beset by money problems, squabbling over artistic issues such as the the sculptor-Chinese artist Lei Yixin and in-fighting in Congress. But now the land is being cleared and piles will be driven into the soft ground to prevent the type of sinking so worrisome at the Jefferson Memorial. So perhaps we can see the light at the end of the tunnel with the granite blocks beginning their overseas journey. The King Memorial could be ready for the grand opening such a monumental project deserves later this year.